What is total hip arthroplasty? Total hip arthroplasty, also known as total hip replacement surgery, is a procedure performed by an orthopedic surgeon that involves removing damaged portions of a hip joint and replacing them with artificial components in order to improve function and relieve pain in the hip area. Total hip replacement is typically recommended to patients who are suffering from chronic hip pain that is interfering with day-to-day life and impacting mobility. Hip replacement surgery is only considered once conservative treatment methods fail to produce successful outcomes. Why is total hip replacement surgery performed? Osteoarthritis of the hip is a type of hip arthritis characterized by painful inflammation of the hip joint caused by cartilage deterioration. The condition can cause severe pain and loss of hip functionality over time. Post traumatic arthritis of the hip is caused due to damage to the cartilage in the hip that develops following an injury, such as a fracture. Rheumatoid arthritis of the hip is a chronic inflammatory disorder characterized by the deterioration of cartilage in the hip due to the immune system attacking the tissues. This type of arthritis can affect other joints in the body as well. Osteonecrosis or avascular necrosis of the hip is caused by limited blood flow to the hip, causing weakness in the bone and subsequent joint space narrowing. What does total hip replacement involve? 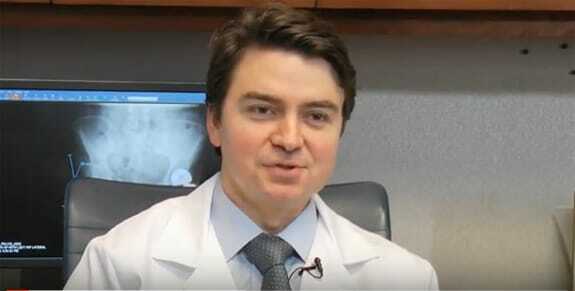 By employing his Rapid Recovery approach — including various interventions taken before, during, and after surgery — Dr. Sculco is able to help his patients return to their everyday lives faster following total hip replacement surgery. Typically, patients can expect to experience some swelling and pain after undergoing hip replacement surgery. Dr. Sculco is dedicated to improving your recovery by limiting post-surgical pain and other side effects. Over the years, he has been involved with extensive research on topics including less invasive surgical techniques, anesthesia use, anti-inflammatory medications, and specific instruments used during the procedure. This research has led Dr. Sculco to a fine-tuned recovery approach that has been proven to decrease inflammation and pain following surgery, as well as accelerate the body’s healing process so patients can get back to doing what they love faster. Learn more about Dr. Sculco’s recovery approach by visiting our Rapid Recovery page.